If you’re planning to visit France, you should prep your itinerary well in advance as there are so many things to see, do and of course eat! This wonderful place is known for its couture fashion houses, classical art museums, and of course – the world-renowned Eifel Tower. But France is also famous for its sophisticated cuisines and very creative pastries and desserts. So be sure to have plenty of time visiting the local patisseries in Paris or France and explore the authentic French pastry! It’s here that you’ll find the perfect food gift for yourself or your foodie friends and family. Image Courtesy of Karen Booth on Flickr. Ah but reality strikes and no plan to travel to France just now? Then just Speaking of French pastry will need to be enough for both of us. In Paris and all across France, there are plenty of cakes and confections that you must never forget to try. One of them is a Madeleine. Described as a cookie by non-French people, this small, spongy, lovely traditional goodie is actually a cake and uses what is known as a genoise batter. Madeleine is a traditional cake from Commercy and Liverdun, in Northeastern France. This humble little treat has a place etched in every foodies’ mind as it’s the appetising focus of attention in arguably one of the most beautiful and powerful pieces of food prose ever. You may guess that the cake was named after a person. Well, you’re right. Some sources, like the New Oxford American Dictionary, say that this delish cake may have been named after Madeleine Paulmier, a 18th-century pastry cook. It is said that they were given her name, by Louis XV of France; doing so in honour of his father in laws cook. Madeleines are very distinctive in that they are baked in a pan with shell-shaped depressions (called ‘dariole’ mould). They may look plain and simple but the process of making these pretty cakes is somehow difficult. If this is the first time that you are baking a cake, making Madeleines may be more challenging for you. It may need a good amount of patience and careful following of instructions. But don’t worry because in the end, you will be rewarded with a truly unique and wonderful little cake that is crisp in the outside, and soft and spongy in the inside. Perfect pair for your afternoon cup of tea! Another barrier in making these pretty little cakes is that they require a specialised pan, something most new bakers don’t usually have around. It is worth checking with your friends or neighbours and see if someone has such pans you can borrow. Or, you can buy inexpensive ones from garage sales or even still , you’ll find lots of choices when you look to buy cake pans online. Make sure you buy at least two as most Madeleine recipes would make for about two dozen of the mini cakes. You know, it’s a drag to wash and butter a pan between baking sessions. Image Courtesy of hungrysofia.com three great Madeleine recipes for you to try. And let us start with the classic one. Here are three great Madeleine recipes for you to try. And let us start with the classic one. This recipe is taken from the book From Julia Child’s Kitchen and called Les Madeleines de Commercy. These are Madeleines with ‘hump’ on top. Per original recipe, all ingredients should be brought into room temperature. For the eggs, it is so they could whip properly, and for the butter, so it does not congeal in the batter before the ingredients have been mixed all together. Julia Child’s recipe begins by combining the flour and sugar in a mixing bowl. Once done, proceed to adding three-quarters of the eggs. Beat the mixture vigorously with a wooden spoon until it resembles a heavy cream. If your batter gets very stiff, add a little bit of the remaining egg, a droplet at a time until you get just the right thickness. Set aside for ten minutes. Meanwhile, melt the butter and brown it slightly so it would produce a nutty flavour. This is the tricky part though because a few seconds longer and you’d have a burnt instead of a nutty butter. Let your melted butter cool in room temperature. Then, beat the remaining bit of egg into the batter and stir in the cool butter. Stir in the salt, vanilla, grated lemon zest, and lemon juice. And hola – your batter’s done! But you can’t bake it yet. You need to let the batter ‘rest’ for at least an hour. Cover it with cling wrap or cheese cloth and then put your batter in the fridge. Around 15 minutes before you put the batter out of the fridge, do prep the pan. You want to grease it very well before scooping the batter to each beautiful scallop-shell holes. Once ready to bake, preheat your oven to 375° F. Using a spoon or spatula, drop a rounded tablespoon in the middle of each Madeleine shell. Do not spread the batter to fill the mould. It will, on its own. Bake the Madeleines for about 15 minutes. De-mould onto a rack, humped side up. Another great recipe to try is that of Daniel Boulud, a famous French chef and restaurateur who owns restaurants not just in London but also in many parts of the US. This recipe was originally published on Bon Appetit website. 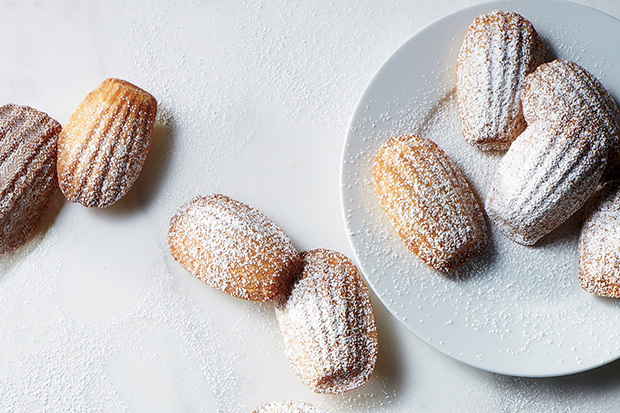 Daniel Boulud’s Madeleines are prepared first by whisking the baking powder, salt and flour in a small bowl. In another medium bowl, whisk the eggs, granulated sugar, light brown sugar, honey, and lemon zest until smooth. Then whisk in the dry ingredients until just incorporated. Lastly, whisk in the melted butter until smooth. Transfer the batter into a pastry bag resealable plastic bag and chill for at least an hour. In your well-greased dariole pan, pipe batter into each mould, filling two-thirds full. 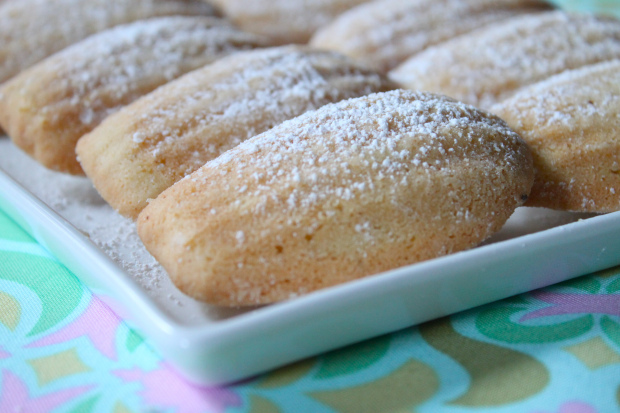 Bake Madeleines at 400° F until edges are golden brown, and the middle is puffed up and springy to the touch. Tap pan against counter to release the beautiful little cakes. Apart from the traditional lemon scent, there are many Madeleine variations you can try. Among the most popular are rose, vanilla, lavender, orange and chocolate. Yes – chocolate! 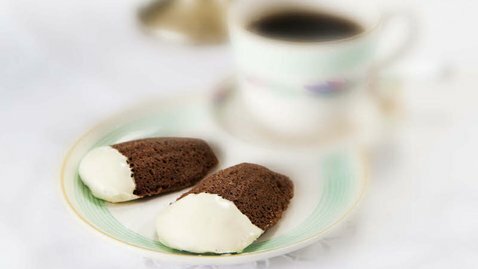 Here’s a chocolate Madeleine recipe from Rachelle Allen, presented on her show Rachel Allen’s Cake Diaries. 100 g dark or white chocolate, in drops or broken into pieces. Start by preheating your oven to 180C/160C fan/gas 4. C/160C fan/gas 4. Then grease the pan by brushing a little of melted butter in each shell mould, making sure that each ridge is covered. Then dust a little flour to each one and tap the excess. Set the pan aside. Next, beat the eggs and sugar in a large bowl on a food mixer with a whisk attachment, or using a handheld electric mixer, for five minutes or until the mixture has turned pale, thick and almost three times in volume. Sift the flour, cocoa powder and baking powder into the egg-sugar mixture and carefully fold in. Then fold in the melted butter and vanilla extract. Make sure you don’t over-mix the batter. You don’t want to deflate the egg mixture. Divide the batter into the moulds, filling each almost to the top. Bake for 12-15 minutes, or until golden and lightly springy to the touch. For the chocolate coating, melt the chocolate in a bowl over a pan of boiling water. Dip each Madeleine into the melted chocolate and allow to set on sheet of wax paper. Madeleines are best eaten warm. And how wonderful and different to arrive at a friends house with a warm food gift of Madeleines? If however you’re thinking of serving some of your homemade Madeleines to your guests the next day, better set aside some batter in the fridge and bake Madeleines several minutes before you serve them. Cooked Madeleines will keep for a day or two in an airtight container, but will start to lose that nice crisp texture after a while. Don’t worry because it’s not going to be the end of the world as your Madeleines will still taste delicious. It’s just that they are simply at their best when super fresh. 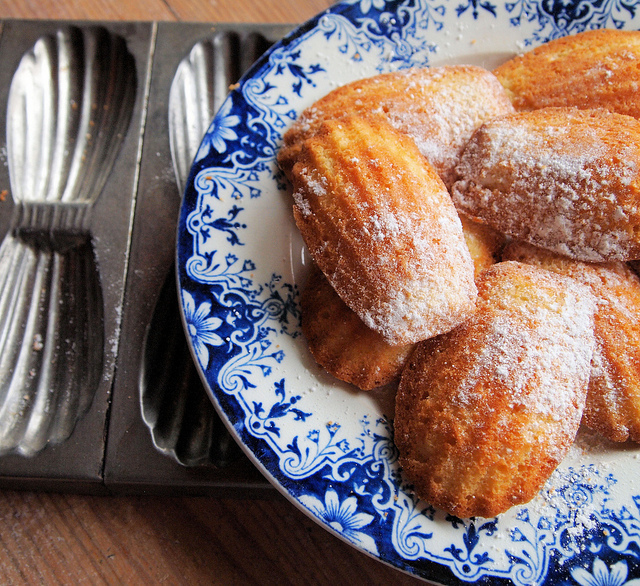 Madeleines are just one of the must-try French pastries. Just want to be clear, we don’t make Madeleines here at Dello Mano. I include these recipes because I think that they’re a superb food gift. Certainly they’re not an easy food gift to buy. If however, it’s a food gift you are looking for with no time to bake, then we have a delicious range of creative, original food and chocolate gifts at our store including our famous Original Classic Luxury Brownies and an array of French and contemporary inspired deliciousness. At Dello Mano we take the work out of your food gift giving. We ship our food and chocolate gifts Australia wide making it easy for you to gift- you simply buy online chocolate gifts and gourmet food products from our Dello Mano website and we take care of the rest. Of course our store is packed with choice as well so if you are in the neighborhood then come on in and check it out. Next post9 Brownie Recipes to Try at home!